Sometimes a house is so spectacular it becomes a celebrity in its own right! Such is the case with my Hualalai luxury real estate listing (MLS# 250438). This week we were honored to have the film crew from HGTV’s “Million Dollar Rooms” tape an episode featuring the home. Nate Harrington, executive producer of HGTV’s Million Dollar Rooms, looking into a HD monitor while filming at Hale Ku Mana. The TV crew spent a LOT of time filming in the master bathroom. Who could blame them? – It’s an incredible space! It wasn’t just any film crew either. It turns out that the executive producer for the entire series, Nate Harrington, happened to be on island on vacation. 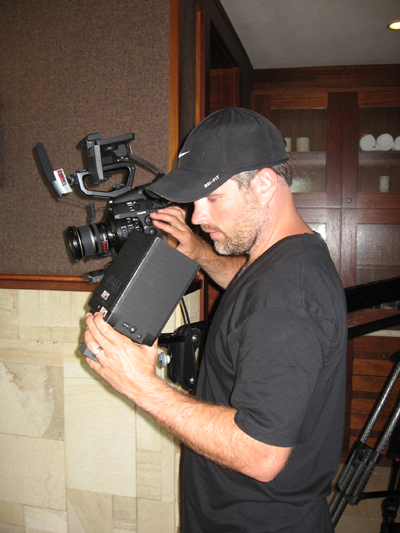 Nate extended his stay in order to film the house himself – a rarity for an executive producer. Nate’s job is to travel the world viewing some of the most expensive real estate on the planet (it’s common to see $20-, $30-, even $100- million homes on the show.) So it really meant something to have Nate say he was impressed with this Hualalai property. The HGTV team spent the day filming inside and outside the home, although they focused on the master suite with its incredible master bath. The HGTV crew was also very interested in the native Hawaiian plants featured in the indoor/outdoor bathrooms and the rest of the property. We enjoyed sharing our knowledge about the importance of these endangered plants, several of which are Kumulipo plants, meaning they have significant importance in Hawaiian culture and are described in detail in the Hawaiian creation chant. The crew spent about six hours in all filming the house before they jumped on a plane and headed back to the mainland. All in all it was a great day! I’ve always known that this Hualalai luxury home is special and it was great to see seasoned professionals be in awe of its beauty as well. The episode featuring my listing is scheduled to air on October 30, 2012 – we’ll keep you posted as we get closer to the airdate.